Place matters. Sometimes it matters a lot. Each of the students in the seminar would have their genome’s (partially) sequenced and we’d spend the semester together, each exploring their own genome, and together we’d discuss what these genomes mean. I began to think of the course as a journey, something epic that a freshman could do their first semester of college. Epic in the general sense of a long and poetic telling of a heroic story – the hero here being each student’s genome, which had, actually, been on a fairly long and harrowing journey through the millennia, passing from one organism to the next, every generation. And given the novelty of the enterprise of – the entering of a newly opened frontier, the personal genome sequence – in search of insights and self-discovery, I could also imagine the students in the seminar as being on some kind of quest themselves. You can imagine my excitement as I thought about this new idea for a course. What a perfect freshman seminar. Students are beginning the adventure of college, of adulthood, of discovering their life’s work. At the same time they could think about how genes and environment, fate and choice, worked to bring about their biological reality – their body and mind. Mid-summer, I learned that my seminar of 12 students had been assigned to B30 Ruttan Hall. Now, let me assure you that I am not a complainer, at least not about most situations. 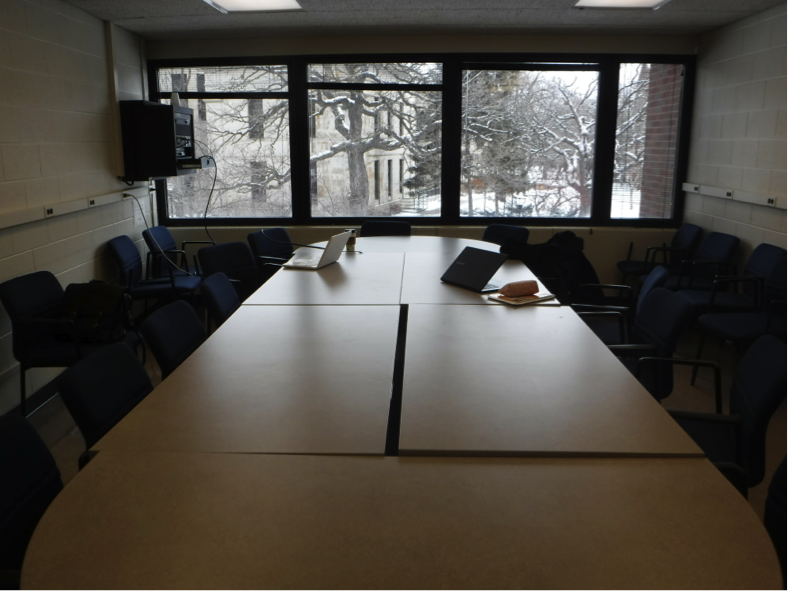 And let me acknowledge that B30 (image at right) is a perfectly fine room: clean, tidy, chairs in good repair and, like so many classrooms at the U of M, with ample whiteboard space and enviable audiovisual technology. 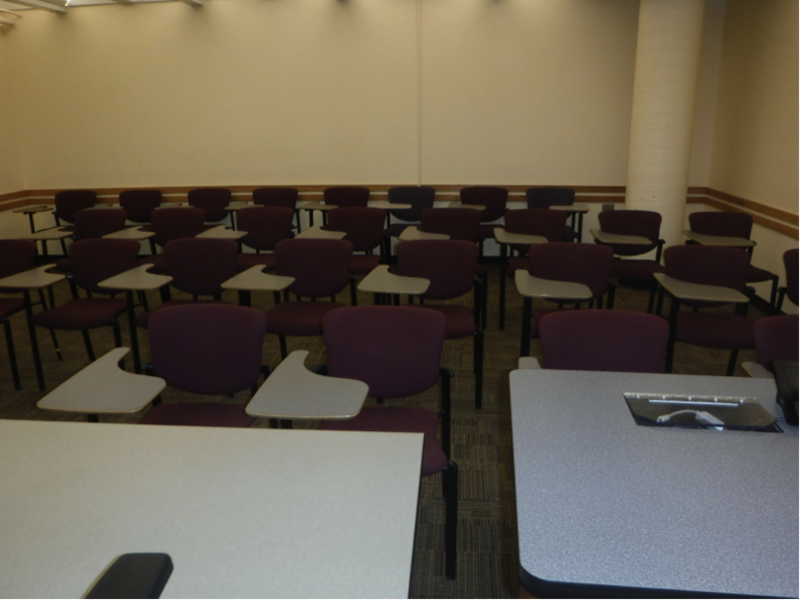 The problem was the mismatch between the unconventional course that I had imagined and that windowless basement room with 30 chairs with tablet arms in a 5×6 grid facing the instructor’s podium, white board, and projector screen. The problem was that I was promising students an epic journey – in a classroom that looked like a typical high school classroom, only without the teacher-personalized décor. I had imagined a small classroom with an oval, circular or rectangular table that we could all sit around for our discussions. Students facing students. The distance closed between them and me. A common table that we all shared. Perhaps some natural light to illuminate the quest upon which we had embarked. Phone calls helped me to understand that a room like I imagined was not available. At least not for a course to be scheduled for the entire semester via the usual route that courses get assigned rooms. I learned, though, that I could reserve a conference room for a meeting. And there were conference rooms in most departments and buildings on campus that could be scheduled by email, phone call, or a visit to the right person. With that realization, I decided to take my freshman seminar on the road, to make it a wandering seminar with a new location every week, an actual journey to support the metaphor of our journey into ‘Genomia,’ and the travels of their genomes through the ages. 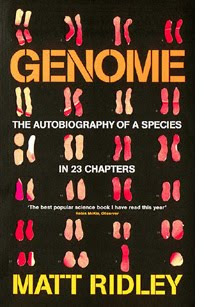 It helped that the book I’d chosen for a text – Matt Ridley’s Genome: The Autobiography of a Species in 23 Chapters – was also organized as a journey. His was a journey through the chromosomes (1 to 22 plus X & Y), pairing each with an aspect of the human condition that a gene on that chromosome touches on. So, with chapter titles such as “Conflict”, “Memory,” and “Pre-history” – and the genes and biology connected to each – to guide me, I went in search of suitable rooms. In this way I found the BF Skinner room (image at left), in the building housing the psychology department, for our discussion of “Instinct and Intelligence”, the military science conference room/library in the Armory to discuss the immune system and “Disease and Stress”, and the natural museum’s conference room next to the Touch and Feel exhibit to discuss “Life and Species”. Overall, it was a little like planning the perfect party – 15 times. But the result was that every class meeting was somewhere new, somewhere congruent with the topic of the week, and had a table where we could take part in discussions as equals, and where we could be physically connected. As you might imagine, pretty much perfectly. Yes, there needed to be an explanation of why. And they needed a week’s notice as to where the next meeting would be. They used their Gopher Guide’s map, and the Connector. And they got to know their campus. In fact, what I came to understand was happening as we visited research buildings, the art museum, libraries, and departments in every college was that the students were getting a feeling of ownership of their university. We took time to consider what academic activity was happening in each building we visited, what scholars normally met in the space we were sharing. We took care to leave every room as good as or better than we found it. I know that places and spaces for learning matter because I have taught and learned in active learning classrooms, laboratories, and seminar rooms and understand that the relationship of learner, teacher and subject material is affected by physical location of the meeting. I’ve also seen the power of my children’s Montessori classroom environment to grant freedom, support curiosity, and engender peer relationships. When your objectives as a teacher call for you to do something more than stand and deliver, it is worth considering what would be the best place for your students to be and the best way for you to be together and reach those objectives. When your objectives include discovery, engagement with the unfamiliar, a stronger sense of belonging in the field or the institution, or perhaps an understanding of what freedom is – then taking the time to find the right space or, in one way or another, to create the right space is a necessary, transformative act. 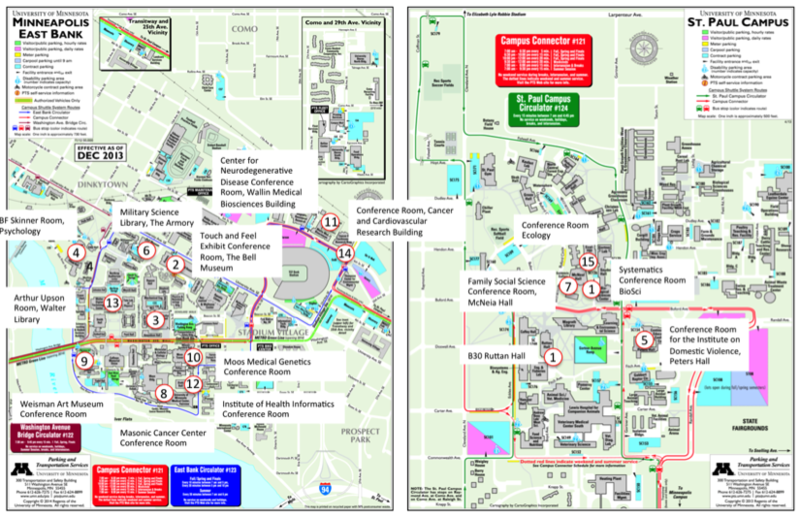 Mapping locations of the wandering freshman seminar. To learn more about the planning of this class, Dr. Matthes has shared slides from the CEI presentation, which feature the key questions he pursued in designing the course, and provide samples of the logistics paper trail that was part of this journey. Slides: The Importance of Place and SpaceThe Importance of Place and Space. To review additional research documents and course design materials, including those related to teaching in SCALE-UP / Active Learning Classrooms, visit: http://www.davidmatthes.com/.